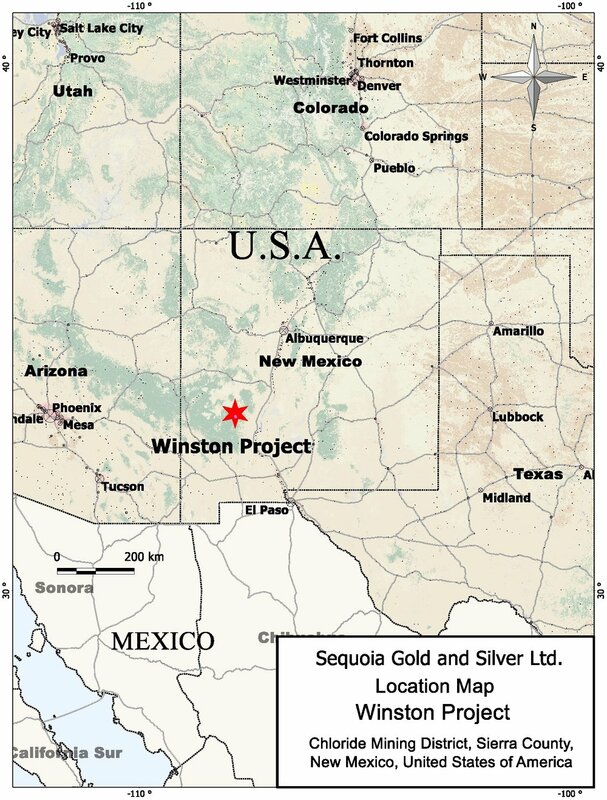 VANCOUVER, CANADA – Far Resources Ltd (CSE:FAT) (FSE:F0R) (OTC:FRRSF) is pleased to provide an update regarding its high-grade Winston Gold-Silver Project, located in Sierra County, New Mexico, USA, and the previously-announced spin-out of these assets. The Winston Project comprises the Little Granite Mine and the Ivanhoe-Emporia Mine, both of which are past-producing silver-gold mines. Management believes that these assets are highly valuable and worthy of a systematic exploration programme, but are not currently valued within the existing corporate structure. In late 2017, Far announced that it was contemplating a Plan of Arrangement to spin the Winston assets out into a new public company as a form of dividend to its shareholders. Due to changing priorities and a focus on advancing its Zoro and Hidden Lake lithium projects, as well as changes in gold and exploration fundamentals, the company put plans for the spin out on hold. Far is pleased to announce that it is again advancing plans to spin out the Winston Project into a newly-formed, precious metals-focused exploration company (“SpinCo”), with the initial goal of advancing the gold and silver assets in New Mexico through a focused programme of exploration and drilling. The company believes that SpinCo has the potential to be developed into an independent and viable company based on the merits of the Winston Project. The company would spin out its interests in the Winston Project with the intent of listing on a public exchange in due course. Completion of such plan and any listing of the resulting entity will be subject to regulatory approval, and the approval of shareholders of Far. Updates on this process, including share ratio to Far shareholders and timing of the record date shall be provided in due course. The Little Granite Mine is a past-producing, high-grade silver-gold mine located in the Chloride Mining District in Sierra County, western New Mexico (Fig. 1 and 2). The area saw major mining activity in the late-19th and early 20th Centuries, with historic records of over 400 mines and prospects in the district. Epithermal vein systems in the northern part of the district exist along dominantly north trends with lesser northeast and northwest trends. The longest continuous vein system in the district, the Great Master Lode, occurs in this area, winding along north and northeast trends for more than 11 km. Vein adularia at the Minnehaha Mine, on the Great Master Lode, yielded a K-Ar age of 26.2 +/- 1.2my, nearly identical to dates for stage two mineralisation in the southern half of the district. Gold-silver mineralisation at Little Granite is contained in two major low-sulphidation epithermal quartz veins (the Little Granite vein and the West, or Jap vein). These veins outcrop in Tertiary age volcanics and run semi-parallel to one another, striking roughly north, and dipping 70 degrees to 80 degrees east. Previous production occurred from workings where the two veins merge. It is understood that the bulk of ore mined was oxidised and free milling containing, silver chlorides and free gold near surface, with the deposits transitioning to sulphide-hosted mineralisation at depth. Historic diamond drilling during the 1980s tested the vein over a strike length of approximately 400 feet (120 metres) mostly to a depth of 250 feet, though one deeper hole was drilled to 450 feet (Table 1). The vein system has been traced for over 600 feet (185 m) along strike by surface drilling and underground development. At the surface, widths are typically 1 to 2 feet, but reportedly widen to between 6 and 12 feet at a depth of 250 feet. The deepest drill intersection to date (Hole LG-7) is approx 400 feet deep. Table 1: Historic drilling results from 1984 diamond drilling programme. Note: this work was not carried out under supervision of a Qualified Person. The assaying, sampling and QA/QC protocols are unknown, and therefore cannot be relied upon. These results are presented as historical information only. The vein zone remains open both along strike and at depth. Historic mine records reported local bonanza-grade ore in some of the ore shoots underground. In late 2013, Far conducted a due diligence site visit to the Winston Project, where they visited the Little Granite Mine area. Three composite samples were collected from quartz dump material near the mouth of the decline, which were reportedly excavated in the early 1980s. This check sampling confirmed the occurrence of local very high-grade silver and gold. Two of these samples, representing the main style of quartz present in the mine, returned values of 179 g/t Ag and 2.9 g/t Au, and 170 g/t Ag and 6.7 g/t Au respectively. These samples show classic boiling textures and are considered to be the material from the upper part of a well-developed epithermal system. The third composite sample found on one of the dumps, containing fine grained grey “cherty” quartz material, returned values of 1,439 g/t Ag and 25.2 g/t Au. The results from the third sample supports the historic reports confirming the presence of “bonanza-grade” shoots within the mine’s main vein system. Two additional samples of the exposed quartz vein were taken from the walls of a collapsed stope immediately north of the main shaft, returning values of 226 g/t Ag and 2.2 g/t Au, and 24 g/t Ag and 0.3 g/t Au. However, both of these samples may have experienced surface leaching effects. All of the samples were collected by Lindsay Bottomer, P.Geo., former director of Far, who transported and delivered them to Acme Analytical Laboratories in Vancouver, where fire assay methods were used to analyse them. The Ivanhoe/Emporia lodes produced gold and silver from workings accessed by a 384 feet deep decline extending into the historical mine. Far believes that there is potential for outlining significant, large tonnage, lower grade mineralisation from the stockwork veins that surround previously mined high-grade veins. The technical content of this news release has been reviewed and approved by Mr. James Moors P.Geo., a qualified person as defined under National Instrument 43-101. This news release contains forward-looking statements, and forward-looking information (collectively, “forward-looking statements”) within the meaning of applicable Canadian and U.S. securities legislation, including the United States Private Securities Litigation Reform Act of 1995. All statements, other than statements of historical fact, included herein including, without limitation, the future draw-downs under the Facility, the anticipated use of proceeds from the Facility, the planned exploration for the Hidden Lake project and the Zoro lithium property, and the anticipated business plans and timing of future activities of the Company are forward looking statements and reflect management’s current expectations and assumptions. Such forward-looking statements reflect management’s current beliefs and are based on assumptions made by and information currently available to the Company, including without limitation, that market fundamentals will result in sustained lithium demand and prices, the receipt of any necessary permits, licenses and regulatory approvals in connection with the future development of the Company’s mineral properties in a timely manner, the availability of financing on suitable terms for the development, construction and continued operation of the Company projects, and the Company’s ability to comply with environmental, health and safety laws. Readers are cautioned that these forward looking statements are neither promises nor guarantees of future results or performance, and are subject to risks and uncertainties that may cause future results to differ materially from those expected as a result of various factors, including, the ability of the Company to close any future Tranches under the Facility, operating and technical difficulties in connection with mineral exploration and development activities, actual results of exploration activities, the estimation or realisation of mineral reserves and mineral resources, the timing and amount of estimated future production, the costs of production, capital expenditures, the costs and timing of the development of new deposits, requirements for additional capital, future prices of lithium, changes in general economic conditions, changes in the financial markets and in the demand and market price for commodities, lack of investor interest in future financing, accidents, labour disputes and other risks of the mining industry, delays in obtaining governmental approvals, permits or financing or in the completion of development or construction activities, changes in laws, regulations and policies affecting mining operations, title disputes, the inability of the Company to obtain any necessary permits, consents, approvals or authorisations, including acceptance by the CSE, as applicable, required for future exploration activities or the acquisition of additional mineral properties, the timing and possible outcome of any pending litigation, environmental issues and liabilities, and risks related to joint venture operations, and other risks and uncertainties disclosed in the Company’s latest interim Management Discussion and Analysis and filed with certain securities commissions in Canada. VANCOUVER, CANADA – Far Resources Ltd (CSE:FAT) (FSE:F0R) (OTC:FRRSF) announces that Mr. Lindsay Bottomer has resigned as a director of the Company, and Ms. Terri Anne Welyki has resigned as VP Corporate Communications. The Company wishes to thank Mr. Bottomer and Ms. Welyki for their service to the Company and wishes them both the best of luck in their future endeavours. This news release may contain forward-looking statements, which relate to future events or future performance, including planned exploration, and reflect management’s current expectations and assumptions. Such forward-looking statements reflect management’s current beliefs and are based on assumptions made by and information currently available to the company. Readers are cautioned that these forward looking statements are neither promises nor guarantees, and are subject to risks and uncertainties that may cause future results to differ materially from those expected. All of the forward-looking statements made in this news release are qualified by these cautionary statements and those in our continuous disclosure filings available on SEDAR at www.sedar.com. These forward-looking statements are made as of the date hereof and the company does not assume any obligation to update or revise them to reflect new events or circumstances save as required under applicable securities legislation. This news release does not constitute an offer to sell securities and the company is not soliciting an offer to buy securities in any jurisdiction in which such offer, solicitation or sale would be unlawful prior to registration or qualification under the securities laws of such jurisdiction. March 6, 2019 TORONTO, CANADA – Far Resources Ltd (CSE:FAT) (FSE:F0R) (OTC:FRRSF) is pleased to announce that it will be assisted by technology and consulting firm BattMat Technologies Inc. to create an advanced strategy for marketing Far’s lithium resources, identifying new technology-driven trends in battery materials, and identifying potential partners and resource acquisitions for battery metals and related technologies. BattMat will be represented on Far’s Advisory Board by Lee Wheelbarger and Roger Wagner, who will bring their unrivalled expertise to Far’s team to help guide the company’s growth in this rapidly expanding sector. As with the company’s recent financing with Alumina, this partnership will allow Far to advance its excellent Canadian hard rock lithium assets but with an eye on future developments, allowing it to identify industry trends well in advance of our peers and strengthening its strategic standing and recognition within the battery and technology industries. Lee Wheelbarger has over 30 years experience in Research, Development, Test & Evaluation (RDT&E) of battery-centered, high-reliability hybrid power systems and electronics, including cutting-edge systems for critical infrastructure, military and marine applications, and is responsible for dozens of patents and inventions. As Senior Technologist and Lead Technical Integrator for the U.S. Army Dismounted Battlespace Battle Lab (DBBL), Fort Benning, Georgia, he managed a budget of over $400MM, evaluated dozens of systems and led the testing and integration of the first battlefield-ready “MilSpec” (1342B 2) hybrid battery-generator system. Mr. Wheelbarger subsequently oversaw the design and testing of mobile auxiliary battery-based systems that have been successfully installed in hundreds of police, emergency and utility vehicles, including ambulances. He currently designs and consults on hybrid solar generator systems that incorporate battery storage using best-of-breed lithium batteries to provide reliable power for critical infrastructure, mobile power and telecommunications applications. He is also managing a project to test sustained solar-battery propulsion and auxiliary power for vessels. Roger Wagner has acted as legal and strategic advisor to leading energy and resource companies over his 35-year plus career, including as in-house counsel to the renewable energy subsidiary of a Fortune 200 company, senior partner in the energy and resource practice of two international law firms and an advisor to companies developing renewable energy, unconventional gas exploration technology, multi-minerals deposits and renewable power. He has counselled companies and government clients of The World Bank, The Asian Development Bank and US AID on reform of the energy and resource sectors, renewable energy and project development and finance. He is currently an advisor to a hybrid power solutions company, a solar energy technology company and an advisor/sponsor of a project to convert vessels to solar-battery power. He was educated at Yale and the University of Virginia School of Law. All of the forward-looking statements made in this news release are qualified by these cautionary statements and those in our continuous disclosure filings available on SEDAR at www.sedar.com. These forward-looking statements are made as of the date hereof and the company does not assume any obligation to update or revise them to reflect new events or circumstances save as required under applicable securities legislation. This news release does not constitute an offer to sell securities and the Company is not soliciting an offer to buy securities in any jurisdiction in which such offer, solicitation or sale would be unlawful prior to registration or qualification under the securities laws of such jurisdiction.